I grew up on canned corned beef, but fresh corned beef is so much more tasty! Cooking this beef in the CrockPot makes it easy, and it makes the house smell wonderful for hours. This is wonderful comfort food, so if you are having a down day, this meal will perk you right up! Place the corned beef with the brine in a 6-Quart Crock-Pot and sprinkle with the seasoning packet, salt, and pepper. Then place the onions, carrots, and potatoes on top. I like my cabbage well cooked, so I add the cabbage on top and let it cook the whole time (if you don’t want it over-cooked, add the cabbage in after 2 hours). Pour the beer over it all, and turn on high and let cook for 5 hours (or until the beef is tender). Serves 5-6 people. 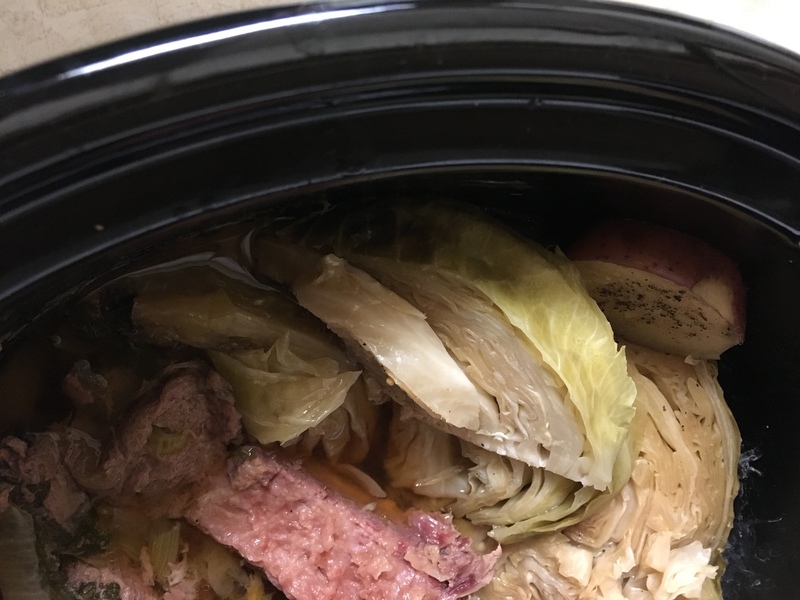 Categories: Food, Recipe | Tags: comfort food, Corned Beef and Cabbage, Crockpot Corned Beef and Cabbage, Crockpot dinner, food | Permalink. Categories: Food, Recipe | Tags: Crockpot pork, easy dinner, food writing, pork loin, rosemary pork loin | Permalink. Categories: Food, Recipe | Tags: food writing, spicy sweet potato fries, sweet potato fries, toddler food | Permalink.